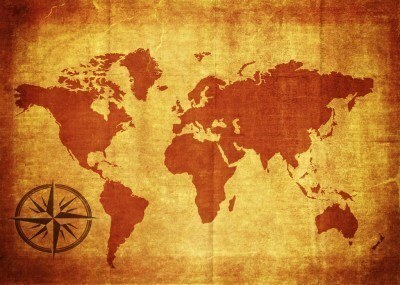 Since the dawn of civilization, mankind has developed unique mythologies and folklore. Some of the most enduring images of this are the creatures that haunt our dreams, keeping children and adults alike away from dark forests, unfathomable depths, and dimly lit alleys. These are 5 of the creepiest creatures from myth and folklore. One of the most prominent Native American tribes in the Northeastern US and across Canada has long told the tale of the infamous Wendigo. 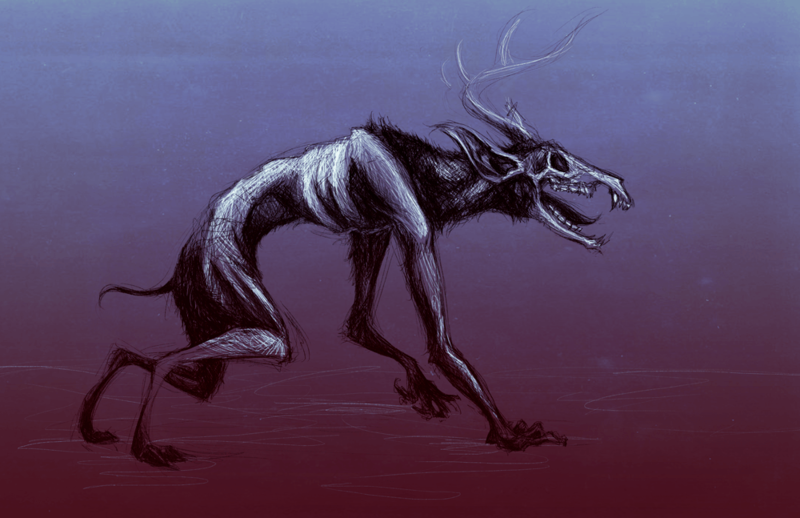 A horrible creature with both qualities of men and monsters, the Wendigo is generally associated with cannibalism, murder, greed, and other sordid vices. In many instances, the Wendigo was once a man who gave into these baser instincts – sometimes further corrupted by a malevolent spirit. Like we will see with many of these fearsome creatures, the Wendigo has had an enduring impact on pop culture. While already a prominent topic in horror stories and television shows, the 2013 film The Lone Ranger put the story into a more ‘realistic’ context with a renowned bandit giving into cannibalism, greed, and murder, thus becoming labeled as a Wendigo. You might not know this one by name, but once we describe the creature I think it’ll start to make sense. An Irish fairy from the Unseelie Court (those who are inclined to darkness, as opposed to the light ‘Seelie Court’), the Dullahan is a headless rider upon a black horse. Sounding familiar? The Dullahan is usually male (but not always) and carries its head under an arm, a human spine which acts as a whip (lovely), and a motley wagon featuring thigh bones as wheels, skin or worm pall as coverings, and other less than pleasant adornments. The Dullahan is unsurprisingly one of the key inspirations for the Headless Horseman (which is most famously featured in the legend of Sleepy Hollow). 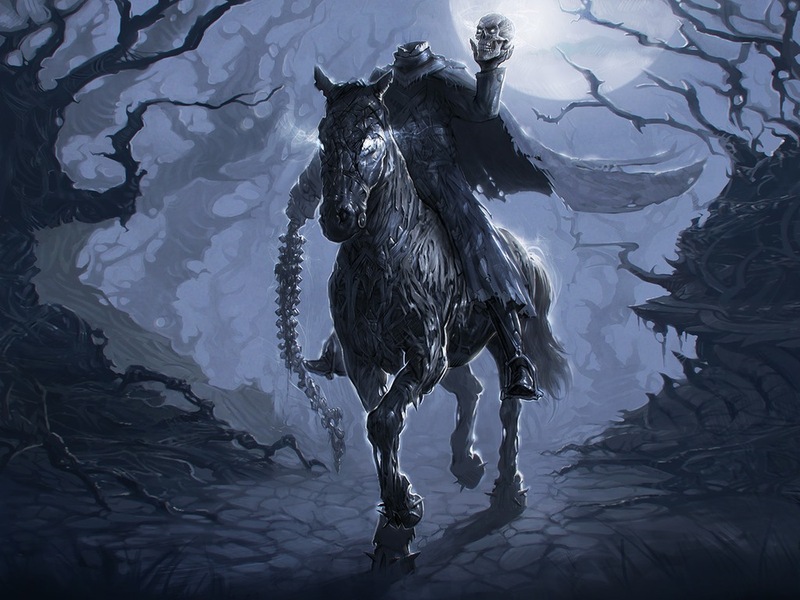 That being said, the Headless Horseman can be found in folklore throughout the world, including (but not limited to): a Scottish clansman named Ewen, horsemen from the Brothers Grimm tales in Germany, and the heroic jhinjhār in Rajasthan, India – a fallen prince that comes back after attempting to protect innocents. 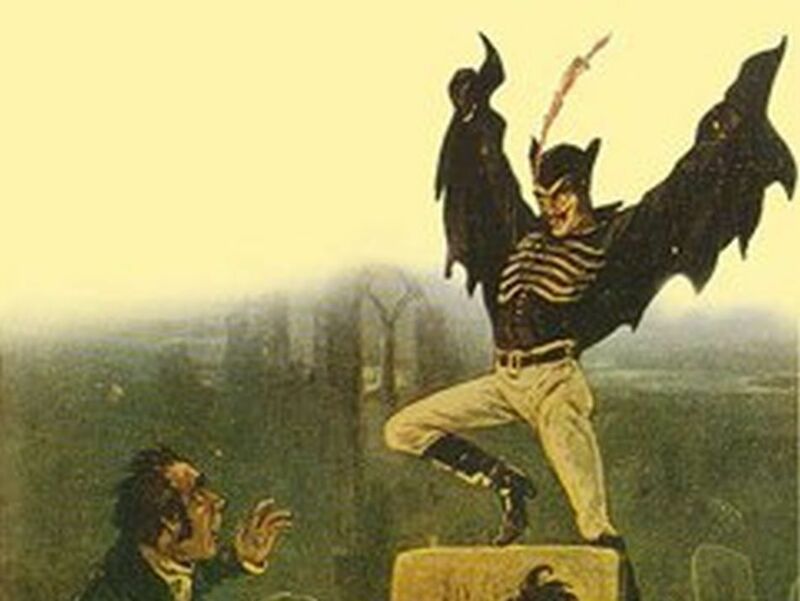 One of the newer such creatures, Spring-heeled Jack grew into a popular urban legend during the Victorian era in England. After the first possible sighting in 1837, there continued to be many more such reports throughout the 19th century – all detailing his distinctive appearance which included ‘devilish’ features, claw hands, the garb of a gentleman, and the ability to leap exceedingly far. While mostly ‘found’ in or around London, there were also tales of the demon or phantom as far north as Liverpool, always leaving chaos and violence in his wake. The legend around Spring-heeled Jack grew, in part, thanks to contemporary stories (including plays and penny dreadfuls). It was thanks to these works that the mythology around him grew to a fever pitch. Despite the ‘mystery’ never being resolved, Spring-heeled Jack still wields influence on the English psyche today – as seen during a particularly unsettling story in the London-based detective show Luther. 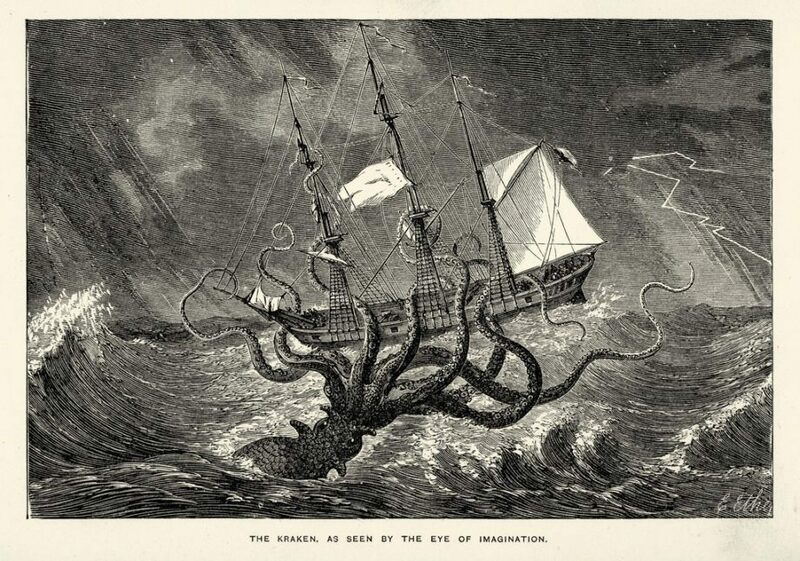 Without a doubt one of the most well-known mythical creatures, the Kraken is a massive sea monster resembling a squid who ingested one (or several) too many steroids. The original Kraken of folklore comes from Scandinavia, with the beast allegedly making its home off the coasts of Norway or Greenland. Where the Kraken is unique is that it does have a clear basis in fact, with actual giant squids able to grow upwards of 50 feet. To the best of our knowledge however, these real creatures have never swallowed a ship whole. As you probably have already seen, the Kraken has been a staple of popular culture in the centuries since the first tales of Norwegian fisherman. 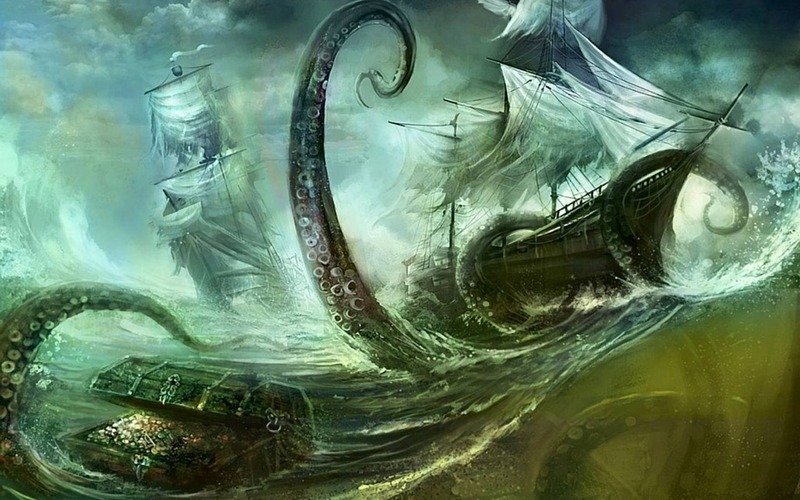 It has been co-opted by modern retellings of Greek mythology, served as the basis for Alfred Tennyson’s eponymous sonnet (which went on the inspire many Lovecraftian creations), and even acted as fearsome hitman of sorts for an equally tentacle covered pirate captain. We finish our sordid tale in Eastern Europe, where we greet the enigmatic Baba Yaga of Slavic folklore. Often depicted as an old crone, Baba Yaga lives deep in the woods in a hut set upon chicken legs (or leg). Though often depicted as a single entity, she is sometimes referred to as three sisters (which each sharing the same name). 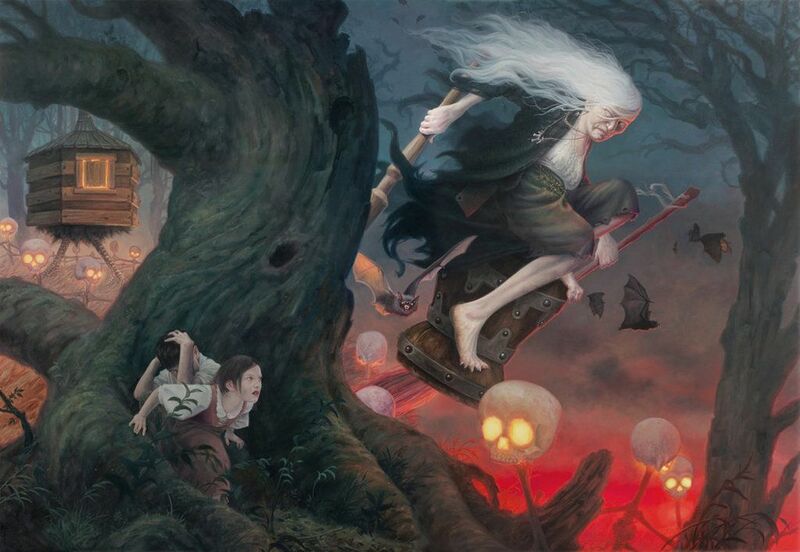 To differentiate herself from the ‘vanilla’ witches we commonly see, Baba Yaga likes to fly around in a giant mortar and uses a pestle to help herself traverse the land as opposed to the more popular broomstick. Where Baba Yaga gets even more interesting however is that she is depicted as both a malevolent force and a helpful one – lending the powerful ‘witch’ an air of mystery and unpredictability. If one is so inclined, they can seek her advice, knowledge, or help – but should beware that it is not easily given. While she has long inspired stories of old and powerful witches in forests, a recent example (we presume) can be seen in the ‘Crones’ of The Witcher 3 (a Polish video game heavily influenced by Slavic mythology). Beware! 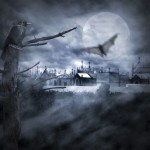 These are not the only supernatural creatures that inhabit stories and texts. Within the myth and folklore of the world are more enigmatic, frightening, creepy, and yes, even heroic creatures than you could possibly imagine!